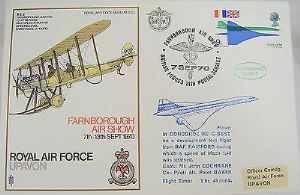 This is one Flown Cover from a Series devised by the RAF Museum, comprising 40 Covers portraying aircraft used by the Royal Flying Corps and Royal Air Force between the years 1912 and 1945. 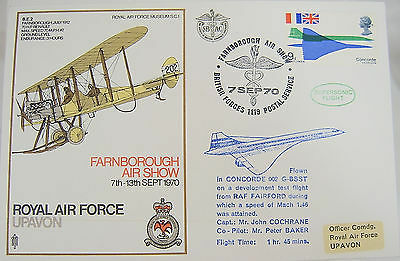 Each has been flown on 'Special Flights' made on the occasions commemorated by the handstamps used on the Covers. SC.1: Flown in Concorde 002 G-BSST on a development test flight from RAF Fairford during which a speed of Mach 1,46 was attained. Capt: Mr. John Cochrane Co-Pilot: Mr. Peter Baker Flight Time: 1hr. 45 mins. Condition of the Cover is well-nigh perfect but there is no card inside.